Since I started knitting, I haven’t really stopped. 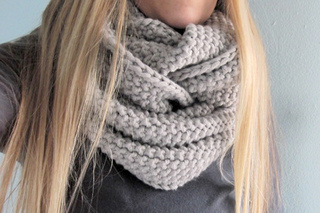 Still, I am in love with the fact that you can knit any and every where. Another friend told me her friend knits while HIKING. I doubt I will ever have that level of dexterity in my fingers or legs, but it does prove the point. I asked the lady in front of me at the post office to take this picture. It is hard to do a selfie while knitting. Part of my problem is that I keep adding new projects to my queue. Let’s just say that my approach to knitting is very similar to my approach to quilting. I know starting one project and then finishing it is an incredibly logical and industrious method of working, but it is also kind of boring. There is just too much out there. A single project does not give me enough to think about. Like with quilting, my mind trouble shoots on one project while mindless working another. All of this is to say, that three months into my year of knitting dangerously, I’ve got one simple cowl finished and ready to share. 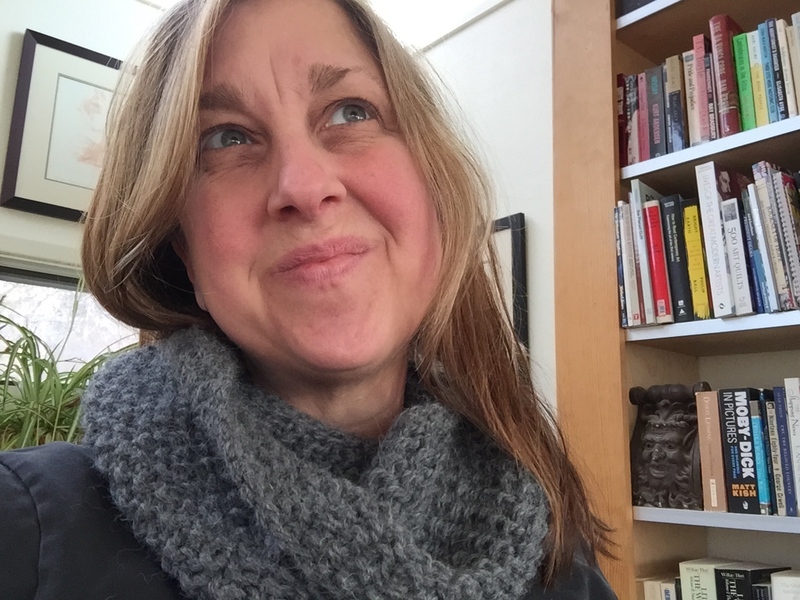 It’s call the GAP-tastic Cowl by Jen Geigley. It looks like this. It is a free pattern you can download by clicking here. More than fifteen thousand versions of this pattern have been made. 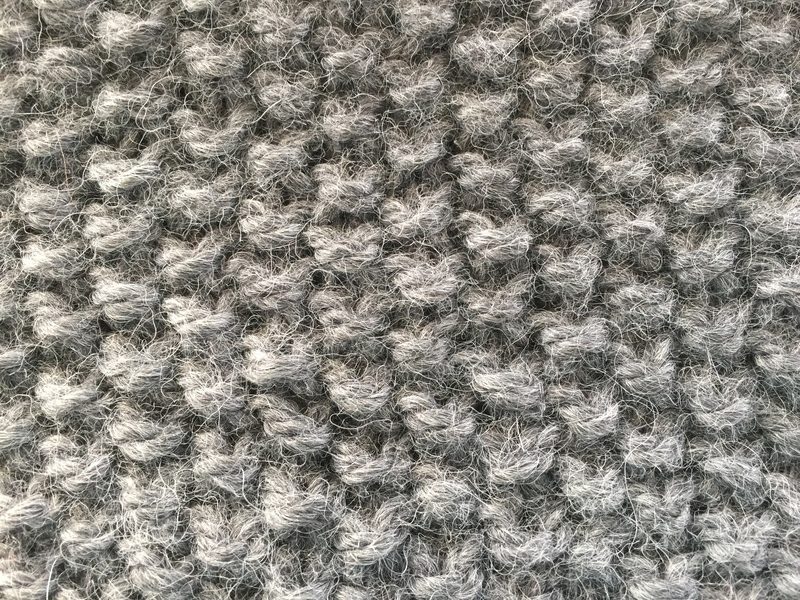 I used about 1 3/4 skeins (about 189 yards) of Cascade Yarns Baby Alpaca Chunky Color 570 Charcoal. 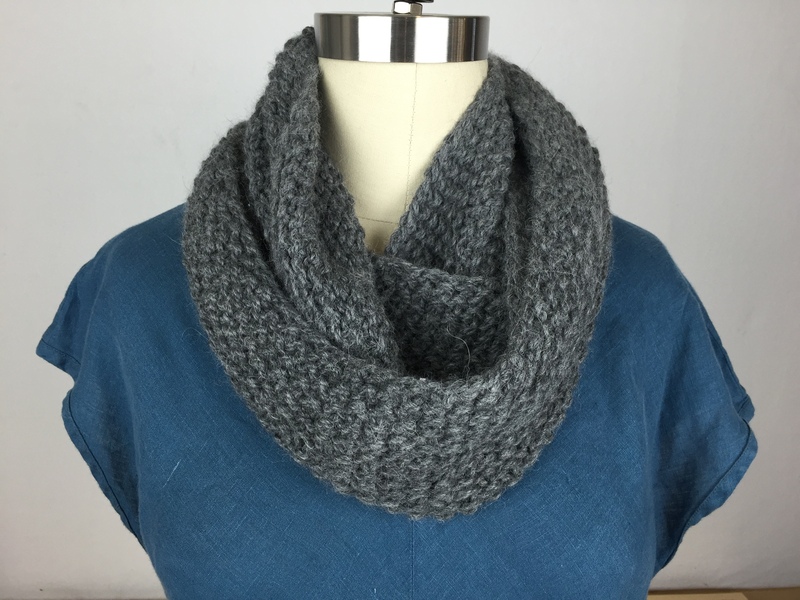 I modified my cowl to make it smaller by casting on only 121 stitches using a US 11 Needle. I also only worked in pattern until the piece measured about eight inches wide. You can read more about it on my Raverly page. How do you get your eyes to look straight ahead in a selfie? It must take some practice. I have been wearing it a lot and feel good to have finished something. Now, if I can only get my sleeves attached to my top down sweater–that would really be something. 04 Apr	This entry was published on April 4, 2015 at 10:31 AM. 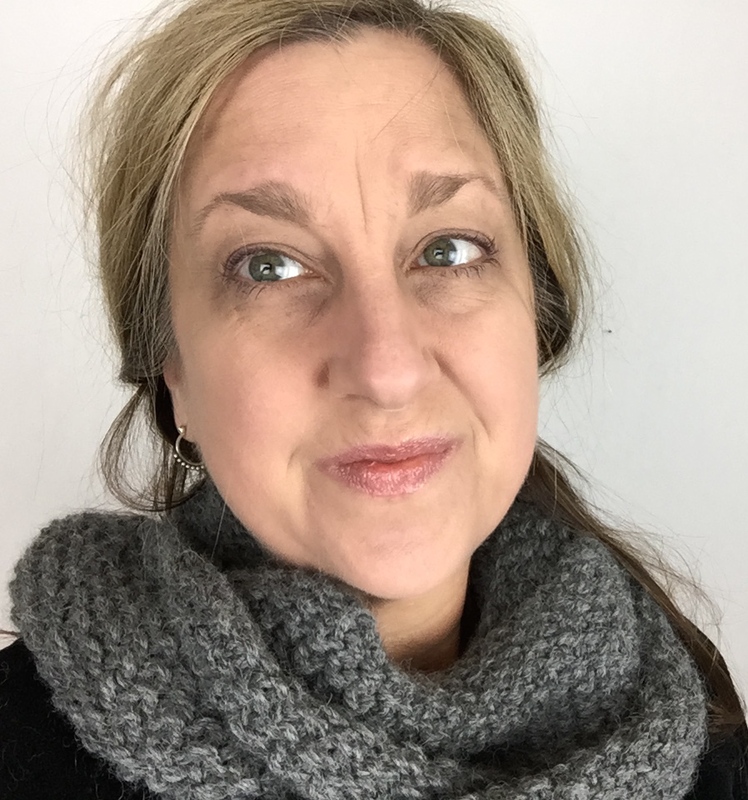 It’s filed under The Knit Report and tagged GAP-Tastic Cowl, RAVERLY, The Knit Report. Bookmark the permalink. Follow any comments here with the RSS feed for this post. Bring some knitting to your Ohio trip to Quilt National. 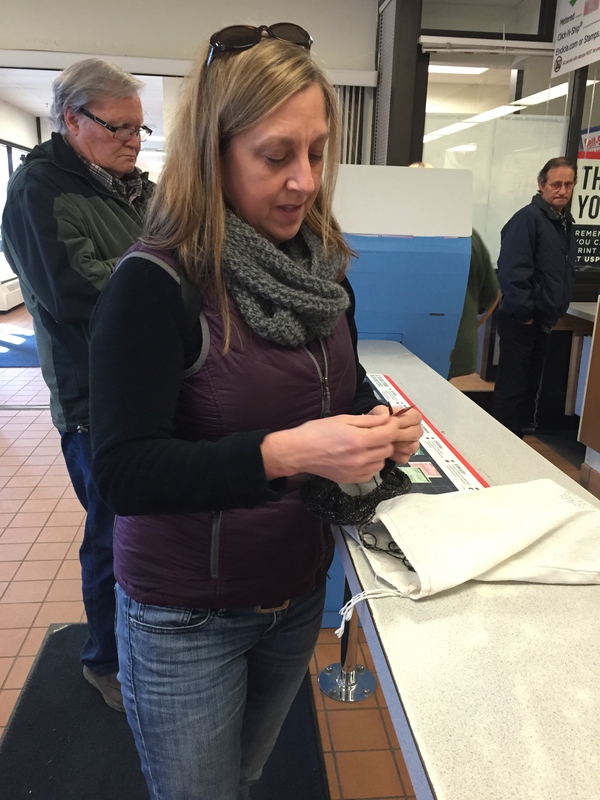 You can knit in the car to and from the airport (and on the airplane!)….. Last time I traveled, I brought four projects which is complete over kill, but YES. I will be knitting in your car. Looking forward to it. Heh. I feel your pain. Ravelry isn’t really good for the whole ‘concentration on a single project’ thing. I like your cowl! Thank you Carrie! I know what you mean about Raverly. It brings out many of my questionable personality traits, especially my obsessive compulsive tendencies.